How We Test Washer-Dryers - Which? Which? tests washer-dryers more thoroughly than anyone else. 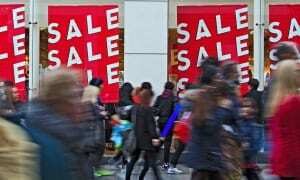 Read on to find out how we test to find Best Buy models. Each of the washer-dryers rated in our washer dryer reviews have been put through a battery of independent tests in the Which? test lab, you can be sure that the ones we recommend really do live up to their claims. How good is it at removing dirt and grime from clothes? Will this washer-dryer dry quickly and evenly? Does it do a good job of rinsing out excess detergent? Will the washer-dryer be quiet and easy to use? How much does the washer-dryer cost to run? Find out which models give top-class results: See the best washer-dryers. How good is the washer-dryer at removing stains? To check how well a washer-dryer removes stains, we place a cloth splattered with chocolate, oil, blood and red wine marks in the drum, along with sheets and other items of clothing. After the wash we measure how much light is reflected off the cloth using a machine called a spectrophotometer, which measures the intensity of reflected light. The more light reflected, the better the machine is at removing stains. And we don't just do this once - each washer-dryer is tested on both its 40-degree cottons and synthetics programs. Will it dry quickly and evenly? 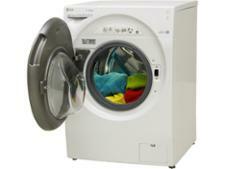 We measure how much time and energy it takes to dry a load of laundry, and rate machines based on their running costs. Determining when clothes are ‘dry’ involves weighing them to see how much water they contain before and after the program. We weigh individual items of clothing to work out how much water each contains. This can vary from 3% for a sheet to more than 20% for a pair of jeans or a towel. The variation between the different items tells us how evenly the load has dried. Is the washer-dryer from a reliable brand? However effective your washer-dryer is at cleaning and rinsing, it's no good if it's prone to developing faults or breaking down. To find out which brands are the most reliable, we survey hundreds of washer-dryer owners every year about any faults or breakdowns they've experienced, and we use this data to calculate reliability ratings for each of the major brands. The higher the reliability rating, the more reliable that brand has proven to be, according to the experiences of owners. A washer-dryer can only qualify as a Best Buy model we recommend if the brand scores at least three out of five stars for reliability, as based on our survey of owners. Alternatively, a model can also be awarded Best Buy status if it has a free five-year warranty as standard. 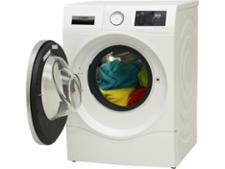 Find out which brands topped our survey on our reliable washer-dryer brands page. Detergent can be irritating to those with sensitive skin. To measure how well washer-dryers remove it during the rinsing cycle, we take freshly rinsed washing from the machine, just before the spin cycle, and spin it in a super-fast spin dryer. This dryer spins at 2,800rpm, roughly twice as fast as a typical washing machine. After the spin, we collect water from the clothes and measure how alkaline it is compared with tap water. 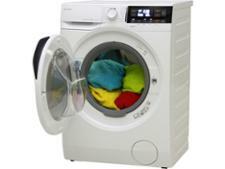 Detergent is very alkaline, so the greater the increase, the poorer the machine is at rinsing. Is the washer-dryer quiet and easy to use? We evaluate every machine's design and controls to assess how easy it is to use. We prefer large and bright lights, accompanied by a clearly marked and self-explanatory label, which is visible from standing and sitting positions. We look for a big drum and a large door with wide porthole that opens to 180 degrees and can be loaded easily from a standing or sitting position. This should be easy to open and close, with no sharp edges. 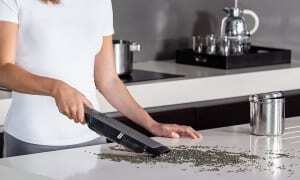 It should require little force and dexterity to remove and replace for cleaning. We look for clearly marked, well-spaced protruding buttons and dials, with descriptions that are self explanatory and easy to read. They should also be easy to grip and turn or activate. Different sizes, textures and shapes, as well as noises that indicate a button has been successfully selected, are helpful to people with visual impairments. We also measure how much noise the machine makes, since there's no way for you to tell this in the shop. Some washer-dryers are so quiet you'd hardly know they're running, while others are so loud you'll need to move your conversation to the next room. Washer-dryers can be far from cheap to run, so we measure exactly how much water and energy each washer-dryer uses at the Which? test lab. The lower the amount of energy a washer-dryer uses, the lower your energy bills. We use our analysis to calculate estimates of how much each washer-dryer will add to your energy bills each year, so that you can compare models on running costs as well as the initial purchase price. Each of our washer-dryer reviews includes an estimate of the annual energy running costs you can expect. Our in-depth washer-dryer tests assess everything from how clean they get your clothes to how much energy they guzzle and how easy (or not) they are to use. But because cleaning and drying power are so crucial, 60% of the overall test score we award to each washer-dryer is centred on these key functions. Below we reveal the full breakdown of how we weight washer-dryer test scores. Washer-dryers have to achieve a score of 65% or more to earn our Best Buy recommendation. 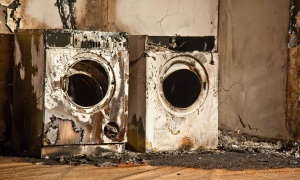 Washer-dryers that score 40% or less are marked as Don't Buy models we think you should avoid.